De Adelaarshorst or The Eyrie in English, is a multi-purpose football stadium located in the city of Deventer which is within the Salland region located in the south-west of Holland. 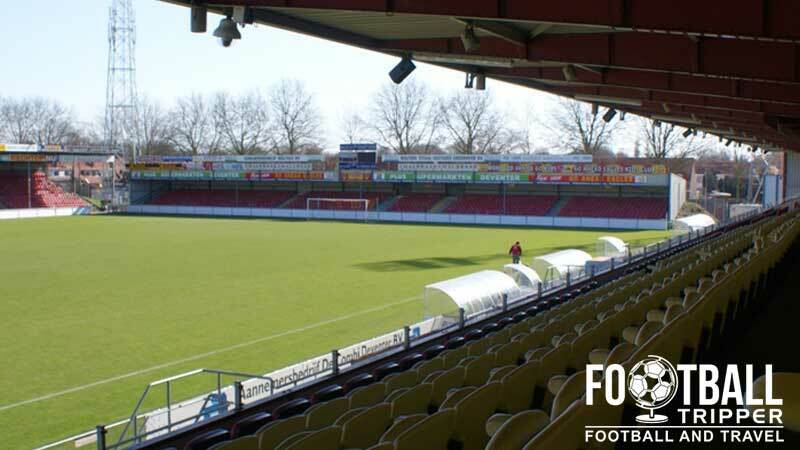 Home to the cool sounding “Go Ahead Eagles” since opening in 1920, the ground has a current capacity of 7,928. 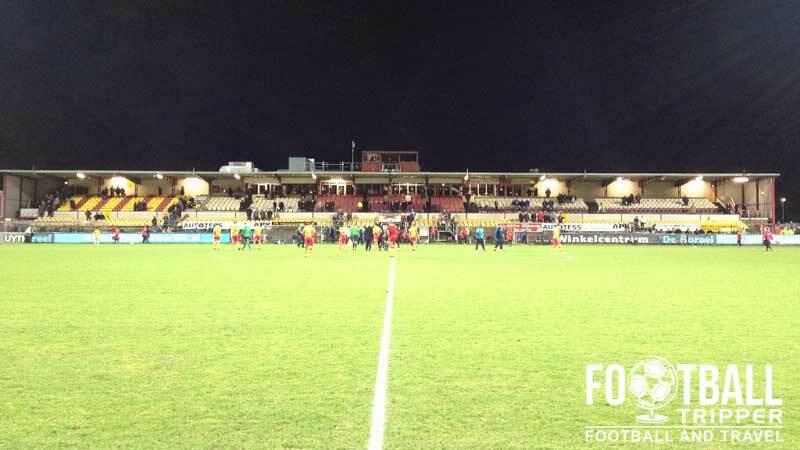 De Adelaarshorst has been the home of the Go Ahead Eagles since 1920 with the first covered grandstand constructed on the site four years later in 1924. 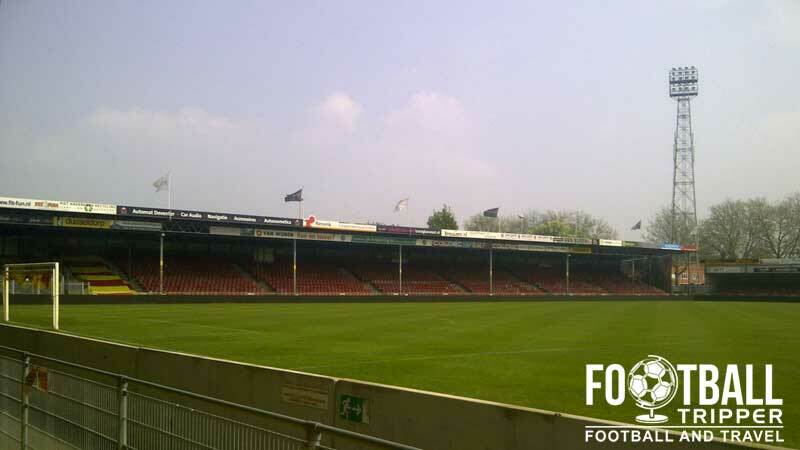 Very much regarded as one of the Eredivisie’s “old school” stadiums and rather reminiscent of English Stadiums built in the 20th century, Adelaarshorst is known for the atmosphere generated by the vocal home supporters. Today the capacity sits at slightly under 8,000 but formerly the capacity has been much larger with the record attendance set in 1965 when 25,000 spectators crammed into Stadion De Adelaarshorst to see Go Ahead take on Glasgow Celtic in a European match-up. Whilst the stands haven’t really changed, the conversion to all-seating significantly reduced numbers. Firstly in the 1980s, terraces within the Ijsselmeer Stand were replaced by old seats from Feyenoord’s De Kuip Stadium and then further terrace spaces were converted in 2006 when additional seats were installed albeit this time they were sourced from AZ’s demolished Alkmaarderhout stadium. Promotion to the highest-tier of Dutch football in 2013 prompted further minor renovations in order to satisfy league requirement set by the Dutch F.A, KNVB. As of June 2014 there is around 6 million euros earmarked to rebuild the main grandstand and Leo Hall Stand but the club are still undertaking feasibility studies. If the project proves to be viable a further 5 million is likely to be sought for the remaining two stands although the club are yet to commit on an exact time frame for these developments. De Adelaarshorst is comprised of four stands: North, East, South and West. Away fans are housed within the south-east corner of the stadium inside section 18 as highlighted in blue in the above seating plan. It appears as if the club shop at De Adelaarshorst is only open on matchdays so you may wish to visit the Eagle’s online store instead as it’s open 24/7. 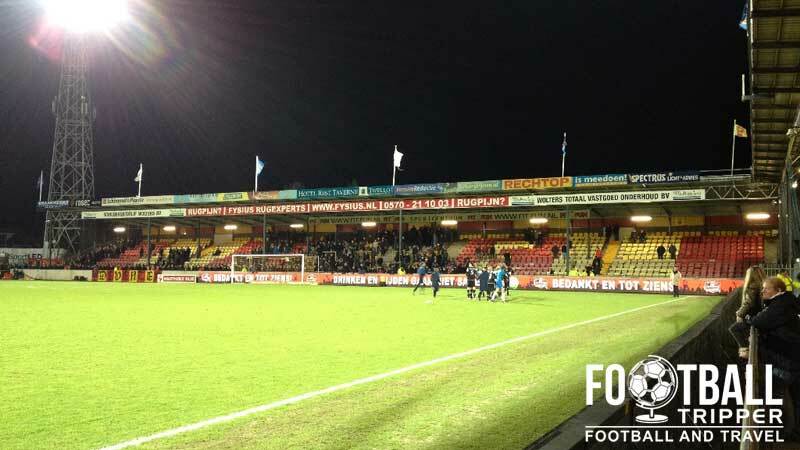 It doesn’t appear as if the Go Ahead Eagles currently offer a stadium tour of the facilities at De Adelaarshorst. Of course if this changes we’ll be sure to update this section. 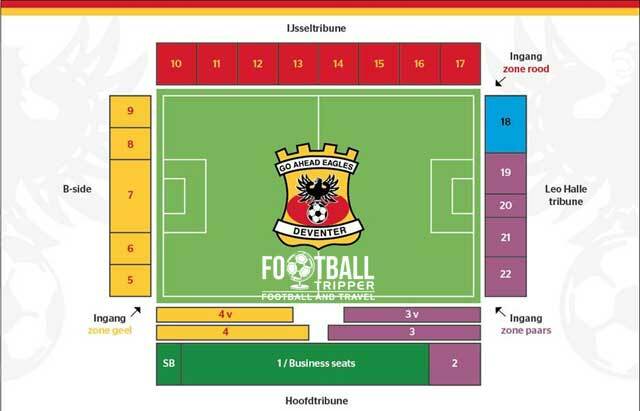 Tickets to see Go Ahead Eagles play at home can either be purchased online from the official website, or in person from the ticket office during the working week between 9.00 am – 5.00 pm, and from 6.00 pm on matchdays. The flat price scheme for division 2 means that fans can pick up league tickets for around € 15.00 and pay only € 12.50 for cup matches. Expect the prices to increase by € 5.00 – € 10.00 euro when the Eagles are promoted to the Eredivisie, as well as when the big three football teams come to town! De Adelaarshorst stadium sits 1.5 km south-east of the historic centre of Deventer, and a similar distance from the train station. As a fairly compact town, the average Football Tripper can easily walk to the stadium from most places within 20 minutes. There appears to be three small car parks at the stadium itself however there’s no official word as to the matchday arrangements. Be prepared to park within the wider residential area and to walk the distance. Deventer railway station has direct services to Almelo and Arnhem as well as inter-rail routes to Austrian and German cities. It is well connected to the rest of the Netherlands making it an easy away day for Dutch Football Trippers. The old fashion exterior of Deventer railway station is simply charming. The main road “Brinkgreverweg” which runs north of the stadium is served by the number 5 bus. This can be caught from outside the train station if you don’t fancy the walk. The two closest airports to Deventer where Go Ahead Eagles come from are Groningen Eelde (114 km) and Amsterdam Schiphol (117 km). As there are no hotels within the immediate environs of De Adelaarshorst you’re looking at the area around the eastern bank of the Ijsell River for accommodation options. Here there is the likes of the Hotel Royal, Hotel De Vischpoorte and Sandton Ijsselhotel.